The OvenStuff Non-Stick 6-Piece Toaster Oven Baking Pan Set includes two 7.7-inch pizza pans, one 8.5-inch by 6.5-inch cookie pan, one cooling rack, one 8.5-inch by 6.5-inch broil pan, and one Fat-A-Way broil pan that allows you to cook healthy meals by eliminating excess fat. Each pan is made with our proprietary DuraGlide Plus non-stick coating, which allows baked goods and other cooked treats to slide right off the pan. Our standard-sized pans are perfect for the smaller ovens found in apartments, vacation rentals, and dorm rooms and make it easy to prepare meals such as sheet pan dinners in single servings. Our bakeware is proudly made in the USA. 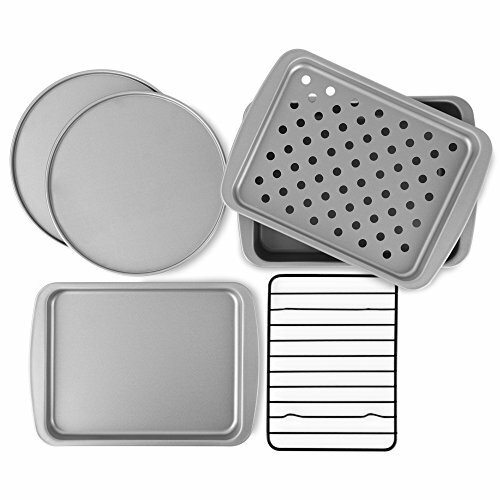 SIX-PIECE SET-EXCELLENT VALUE: Our personal size baking pan set includes everything you need to start cooking in your toaster oven! The set comes with two 7.7-inch pizza pans, one 8.5-inch x 6.5-inch cookie sheet, one 8.5-inch x 6.5-inch cooling rack, one 8.5-inch x 6.5-inch broil pan, and one 8.5-inch x 6.5-inch Fat-A-Way bake and broil pan. PERFECT FOR SINGLE SERVINGS: The OvenStuff toaster oven set is ideal for making meals or cookies in small batches in your toaster oven. No need to waste time or energy using your regular oven! STANDARD SIZING: Our six-piece set is sized to fit perfectly in most household toaster ovens and can also be used in conventional ovens. NON-STICK FINISH: The OvenStuff baking pan set is made with a proprietary DuraGlide Plus coating that allows baked goods and other treats to slide right off the pan for an easy cleanup.